This Friday, the exhibition closing the Fashion Tech Week Paris, offered an instant immersion in the heart of the lattest trends in innovative fashion. 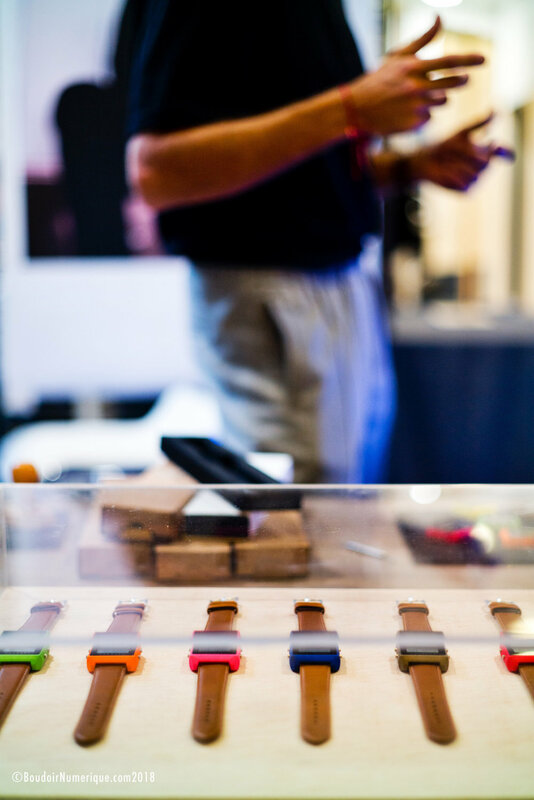 The opportunity to discover products, collections and services, to talk, test, admire, touch, pre-order, in short to learn more about the work of the 27 exhibitors hosted by the ESCP Europe business school. Among the different themes addressed by the event, such as responsible eco-fashion (for instance, belts made from recycled bicycles tires of the brand La vie est belt) or fashion 2.0 (for example, the decision tool Matchmarket to help brands detect their future best sellers, before the launch of their production), Le Boudoir Numérique chose to do a focus on 3D printing. Thus, at Lazaare, Robin Girard prints in 3D casings for his retro-vintage watches, in collaboration with French company Sculpteo, in an eco-responsible approach "zero waste and short circuit in terms of logistics", points out the creative director of the brand. The Mlle 3D brand invites to reinterpret the traditional know-how of embroidery or knitting, through additive manufacturing, "so that it fits into the clothes we wear every day," explains stylist Laura Deweilde. Marine Arnoul is also interested in every day clothings, "to give them a futuristic touch, to give a fashionable side to science fiction that inspires me," she notes. 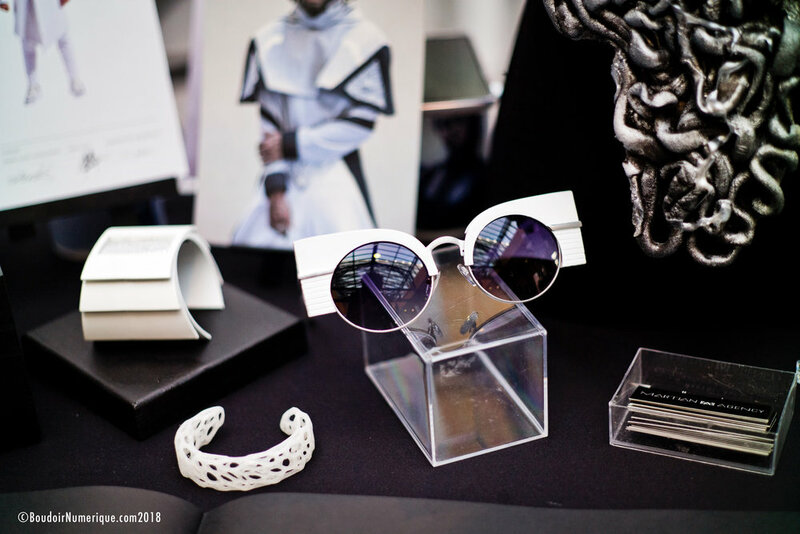 The designer, whom her entourage tenderly describes as a "Martian", 3D prints the helmets, glasses, bracelets and other accessories of her geeko-spatial creations, united under the label ... Martian agency. Finally, in addition to a workshop about "Good practices for the use of fashion tech data", the exhibition ended with the innovative trade fair Avantex Paris, partner of the event, granting the public’s award. The lucky winner is Cover-Dressing, a label aimed to make shopping easier for people with reduced mobility. 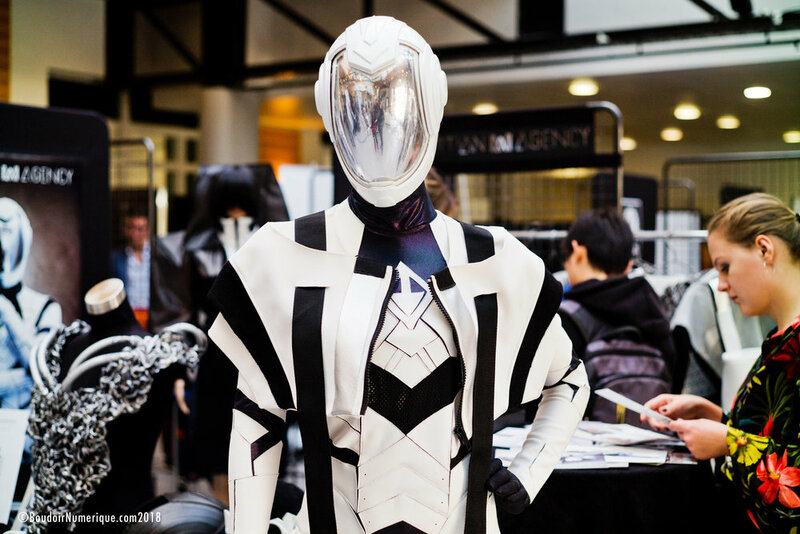 * The exhibition of Fashion Tech Week Paris took place on October 19, 2018, as part of this week dedicated to innovative fashion, that opened on October 15, 2018. * Read also, on Le Boudoir Numérique, the interview of Alice Gras, co-founder of Fashion Tech Week Paris : "Fashion and technology communicate better".